Powers/Abilities: As either Radion or the Ravager, Sorel could absorb, generate, and manipulate vast amounts of radiation, in the form of heat, light, etc. These energies also vastly increased his strength, putting him in perhaps the Class 10 range. He once used his energies to amplify the radioactive power in the Puppet Master's clay, increasing his ability to control others. Any means which drain his radiation will leave him powerless. His Ravager armor granted him greater control over his power, which threatened to achieve critical mass. Sorel is highly intelligent and is one of the world's foremost authorities on radiation. He has access to all of the resources of Project: PEGASUS. Weight: (normal) 170 lbs. ; (as Radion) 210 lbs. (Iron Fist I#4 (fb)) - Henri Sorel was a research physicist employed by World Health. He was also the director of Project: Damocles, which was an all-out international effort to develop a universal cure for radiation poisoning. On day 374 of his research, he made a breakthrough while working in seclusion. However, he was then confronted by agents of Ward Meachum, who sought to buy the cure from him. When Sorel resisted, the men beat him savagely. He lay in the ruins of his lab for hours, covered with a number of nuclear isotopes, but also doused in the chemicals for the cure. He survived what should have killed him, initially without ill effect, but after several days he began to mutate into a nuclear monster. He sought help from scientists to no avail. Finally, in desperation, with his sanity affected by his mutation, he sought the assistance of a criminal somewhat experienced with radiation, Phillip Masters, the Puppet Masters. (Marvel Two-In-One#9 (fb) - BTS) - Masters agreed to assist Sorel, in exchange for his aid in gaining vengeance on the Fantastic Four, specifically the Thing. (Marvel Two-In-One#9) - Radion amplified the radiation in the Puppet Master's Wundagorian clay, enabling him to control Thor, forcing him to attack and defeat the Human Torch, Invisible Girl, and Mr. Fantastic (the Thing was out of the building). Thor came to his senses and stopped before killing them, even treating them as Dr. Donald Blake, but then Radion poured more power into the clay and allowed the Puppet Master to retake control. As Thor fought the Thing, the Puppet Master and Radion confronted them, and Masters tried to take control of the Thing as well. However, the Thing's ward, Wundarr, then appeared beside his "Unca Benjy." 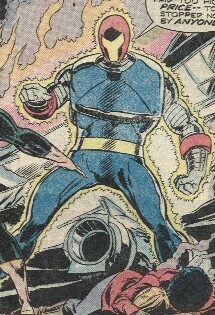 Wundarr's energy absorbing powers left Radion powerless, and he fled from the heroes. The powerless Puppet Master was easily captured by the others. (Iron Fist I#4 (fb) - BTS) - Sorel constructed a suit of armor to contain his energies to prevent them from building to critical mass. He then traveled to London in hopes of using his radiation draining equipment to cure himself. He renamed himself the Ravager. (Iron Fist I#3) - The Ravager made his way to Heathrow Airport to steal some radioactive materials. Out on the tarmac, his bright radioactive glare blinded a pilot on an incoming plane, causing it to crash, injuring and killing some of the people aboard. Also aboard were Danny Rand (Iron Fist) and Misty Knight, who attacked him and were defeated, with Misty's bionic arm being destroyed. Iron Fist tracked the Ravager's radioactive trail to the General Post Office Tower, where he again fought the Ravager, this time shattering his armor in the mistaken belief that it was the source of his power. However, the destruction of the armor merely released Radion, hastening his atomic decay, increasing the risk of him achieving critical mass. Radion then unleashed a blast that blew up the upper part of the tower. (Iron Fist I#4) - Recovering, Danny discovered Sorel's records and learned his origins. He then confronted him as Radion--maddened by his seemingly imminent destruction and seeking to take London with him, leading him into Sorel's laboratory in the basement of the facility. There he used Sorel's anti-radiation transformer to drain Radion's power, reverting him back into Sorel, restoring his mind in the process. (Marvel Two-In-One#55 (fb) - BTS/Official Handbook of the Marvel Universe, Deluxe Edition#10: Project: PEGASUS) - Sorel joined Project: PEGASUS, becoming the head of the human resources research dome, nicknamed the Compound. 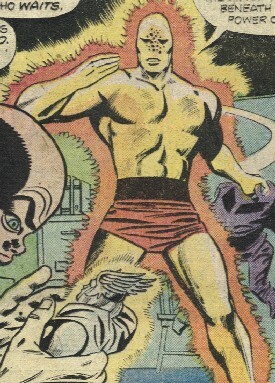 Under federal authority, Sorel began to take into custody various superhuman criminals (including Solarr, the Rhino, Klaw, Electro, Moonstone, Blackout, Bres, Vibro, Nitro, Equinox, Fusion) as well as certain superhuman individuals without criminal records whose powers were deemed of "national interests" to study (including Nuklo, Wundarr, Thundra, and the Dazzler). Other individuals volunteered for examination, including Captain America, Quasar (Vaughn), the Thing, Giant-Man (Foster), and Captain Hero (actually the Super-Skrull). Sorel's goal was to examine every superhuman individual in the nation in order to quantify and classify his or her special abilities, but he could never get the budget to do so. (Marvel Two-In-One#55) - When Nuklo was released from his containment by Dr. Thomas Lightner, Sorel tried to peacefully guide him back into his cell. Giant-Man and the Thing fought Nuklo and managed to contain him, but they received an earful from Sorel for physically abusing the intellectually arrested superhuman. The Thing apparently had no idea that Sorel had been Radion. (OHotMU#10) - The federal authorities supported the Project's study of superhuman criminals since it was interested in devising incarceration facilities capable of neutralizing superhuman powers. The human resources research dome was eventually ordered to be shut down due to the number of dangerous incidents that occurred there. However, research done in the Compound enabled the government to build the Vault, a special prison designed to contain superhuman criminals. Minimal such research continued at Project: PEGASUS. (Marvel Super-Heroes III#3/5 (fb)) - Sorel worked with Blue Shield, who had succeeded Quasar as chief of security at Project: PEGASUS. (Marvel Super-Heroes III#3/5 - Fall 1990) - Blue Shield (having retired from his position of security chief but still needing employment) willingly allowed Sorel to test an experimental process, which overloaded, injuring Blue Shield. The overload was found to have been caused by the new chief of security, Firebolt, who had been sabotaging equipment for his true bosses at Roxxon. Blue Shield defeated Firebolt and was convinced to return to activity as security chief. (Avengers Unplugged#5 (fb) - BTS) - Sorel was employed at the Vault, presumably in the design of equipment to contain superhumans. (Avengers Unplugged#5) - Sorel was on-hand when the Guardsmen and several Avengers (Black Widow, Giant-Man (Pym), Hercules, Vision) delivered Nefarius to the Vault. Sorel was pressured to design better containment equipment for Nefarius within 24 hours, as his lawyer had obtained a court order preventing them from keeping Nefarius drugged 24 hours a day. However, the Guardsmen unwittingly brought Nefarius past Moonstone (Sofen)'s cell, and Nefarius, who had been playing opossum broke free and attacked her. The Avengers eventually subdued Nefarius. I'm surprised that Sorel was not one of those called in during the difficult second childbirth of Sue Richards. The story was by Byrne, who had drawn the Iron Fist issues and MTIO#55, so he knew all about Sorel. That's usually his thang! Regardless of how it's been shown before, I maintain that PEGASUS is an acronym, and thus should be in all capitals (+/- with periods), just like SHIELD. On that a related note, HYDRA has (by convention) been all capitals even though it's not an acronym, as it was measured against SHIELD. That's debatable. The Spider-Man character SHOC has also achieved capital status, and even periods in most cases, despite it not ever being revealed as an acronym. I disagree with this one, but have lost the war!